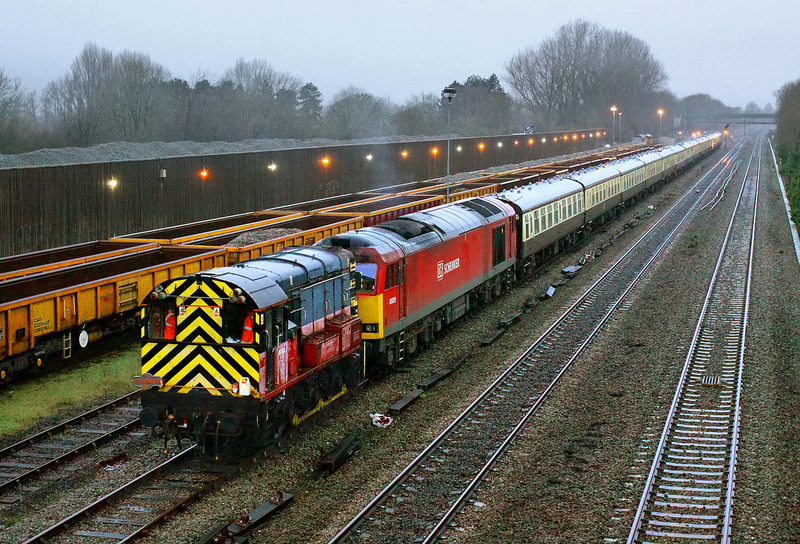 08742 trundles slowly along No.1 reception siding at Hinksey Yard on 2 January 2016 with the Pathfinder Tours 1Z62 14:23 Oxford to Birmingham New Street 'Mini Tug' railtour. The vintage 350hp English Electric shunter has quite a load, made up of 60020, thirteen coaches, and 66001 on the rear. Although a Class 60 over the Cotswold Line, and the visit to the Morris Cowley Branch were obviously selling points for this tour, to some passengers this Class 08 haulage may well have been the highlight. The shunter worked the train for less than a mile, from just beyond the footbridge in the background. Unfortunately by this time it was nearly dark, so it's lucky that the train's slow speed only required the use of a shutter speed of 1/250sec.